We believe that children are not just the church of tomorrow but are part of the church of today. for activities. We also offer a fun variety of workshops, events, VBS and summer camps. 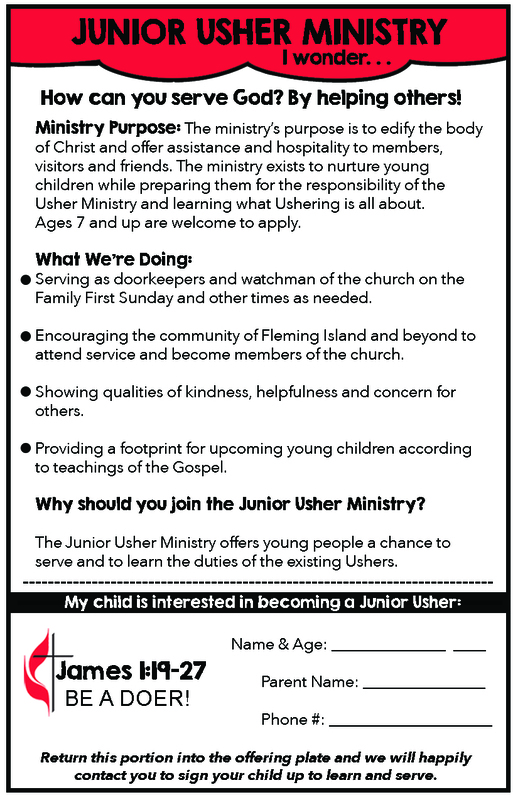 Children's Ministry or would like to volunteer. Congratulations to our staff member Ginny on her beautiful new girl and for this wonderful baptism day! Many thanks to Blake Olsen and Charles Wade who spent their time on this big project!! A few more details to go, and it will be all ready! We still need help to put the dome climber together. Russ Kamradt has headed up having the mulch delivered and that part is finished up. It looks great! So exciting! **If you would be interested in helping regularly with weed control, do let us know! Want to help? Contact Nora! DOES YOUR CHILD LOVE A GOOD CHALLENGE? The new church year is upon us! We would like to help our children grow in their knowledge about prayer, scripture, small groups, worship & invitational evangelism, serving and financial faithfulness. If they haven't given one to you from Sunday School yet, I encourage you to pick up the "Sunday School Challenge" worksheet. It is like church bingo that is rewarded with a special treat after completion. Simply initial each spiritual growth opportunity that your child has completed (ex: pray with your family at bedtime) and turn them in by the end of the current month This will be a fun way for our children to grow this year! Godly Play is our exciting curriculum! We kicked off our first Sunday with the "Circle of the Church Year" in 2017. If you are a parent or guardian of toddlers through 6th grade students, feel free to contact Nora Davie to see what the circle is all about! the children return for communion every Sunday with a children's ministry team member, and then return to class to be signed out by parents. the 1st Sunday of Every Month is all about families! D.O.C.K. parents ( made up of toddlers through 4th grade) and their families sponsor Hospitality, where we bring snacks to share with the congregation after worship. this is a special sunday for our families to attend and for the children to take part hands - on in worship and enjoy children's moment. want your child to be involved hands-on? there is a sign-up sheet at the preschool door, or contact pastor heather or Nora davie to sign up! See the "children's ministry branches" section below for more information on what area your child will join based on age. Questions? Contact Nora at NDavie@fiumc.org or 284-3366. Our nursery program features weekly Bible verses and related Sunday school activities for even the littlest children to come play, pray and learn. Our nursery staff have all undergone background checks and training in our Child Protection Policy as well as CPR and First Aid training to insure the safety of all of the children. We provide nursery care for our 9:30 AM service (0-2yrs). Our Sunday school classes meet after they are welcomed in from the sanctuary on regular Sunday mornings: kindergarten and first - fourth grades. *Toddlers & Pre-K (3-5 yr olds) report directly to their classroom by 9:30 parent drop-off. We use the Godly Play curriculum. All volunteers have been screened and trained in our child protection policy. Family First Sundays K through 4th grade: On the first Sunday of every month, Kindergarten through fourth grade meet all together as a church family for a fun activity in room 323 after being welcomed in from the Family First Children's Moment with our Team Members. The children return for communion with our Children's Ministry Team Members and then return back to classroom 323 to be signed out by parents at the end of the service. Dare to be a Disciple! This 5th & 6th grade group is a bridge between the younger classes and the youth. With the help of the "Dare to Be a Disciple" jars, students discuss important topics and Godly Play stories, as well as create smash books during their student led journey. Held Regular Sunday mornings after being welcomed in from the sanctuary/9:30 service. They first meet to hear the Godly Play story with pre-k through 4th grade for an intergenerational moment and then head to room 323 with their Children's Ministry Team Member to continue. Family First Sundays: S.U.R.G.E. students attend the worship service in the sanctuary. This prepares them for sitting in on services regularly when they are older. Youth Sundays: They will attend worship in the Sanctuary (the 3rd Sunday of every month). Communion: S.U.R.G.E. students return to the sanctuary to take communion every Sunday. Contact NDavie@fiumc.org if you would like to be a screened adult S.U.R.G.E. facilitator, as we have a need! We want to give all of our children the opportunity to serve as ushers and acolytes, as well as participating in the prayers, Scriptures, music, and witness of the church. KidSPLASH | Ages 1st through 3rd grade. Come and be submerged in God's love! This program offers small group events where children can build community and learn about faith. Check back for new events! Our ministry wish list for items to support Sunday School (such as art supplies) can be found here. We can also use donations of peanut free snacks such as: Goldfish, Welch's Fruit Snacks, SnackWells Vanilla Cream sandwich cookies and Lucky Charms. We would love to have you as a screened, trained volunteer to help with Toddlers and Pre-k through 6th grade Sunday School. Contact NDavie@fiumc.org for more information. **We are actively seeking teaching volunteers ("facilitators") for the S.U.R.G.E. Class and an additional toddler room teacher. We would love to have your child involved with participating in worship on the Family First Sundays (the first Sunday of every month). Help could include things such as reading the scripture, reading the prayer, being an acolyte, singing, or other skills that your child may have to offer for our special Sundays. Contact Nora Davie or Pastor Heather Harding for more information. You can find information on our Junior Usher program here. On this special day, our soon-to-be Kindergartners and 5th Graders will move on up as we send all of our children on their way into the new school year in prayer. It is a great kick-off to new friends, new teachers and new routines as we focus on keeping God as the center of it all. Planning has started and we could use your help. Yellow Peeps Chicks - when buying Easter candy, pick up an extra package of Chicks. We will need one per child. If you are interested in volunteering or think you are, click on the link below to sign up or to see positions available. An evening of good food and entertainment at FIUMC! Talents of all kinds and ages welcome. Thank you to all who participated and enjoyed dinner with us this year, we had a lot of fun and appreciate your support!! SHIPWRECKED VBS: Was an amazing week that ended with an equally awesome Sunday VBS Morning! Thank you to all that participated!! Ages: 3yrs - 5th grade (grade completed). Cost: $25 ($5 discount if registered by June 30th). Adventure, creativity, possibilities -- coming to a shore near you! This VBS will help anchor us in the truth that Jesus carries us through life’s storms. Adventure Camp is a great annual program lead by FIUMC and Sharing Tree Preschool teachers at the FIUMC campus. It is a wonderful opportunity for your children to experience a summer week of learning about God's love in hands-on, creative and fun ways, that meet them where they are. Plans are excitedly underway, and we look forward to another awesome year with these amazing kids! Ages: 2yrs-6yrs (based on September 1st cut-off, must be potty trained). Cost: $100 with 10% sibling discount. (Note: Forms and payment must both be submitted to complete registration). Thank you for another amazing camp week!! Adventure Camp 2018 No Names from Nora on Vimeo. Talents of all kinds and ages welcome! Register today! Proceeds to benefit the Children's Ministry. Registration closed. Thank you for the amazing participation, it was a wonderful night!! Join us for a fun night at FIUMC! There will be a chili cook-off, friend "jail", Trunk-Or-Treating, food and fun! Contact Nora Davie for more info or if you would like to Volunteer. NDavie@fiumc.org. CALLING ALL AMATEUR MUSICIANS: We are looking for musicians of all kinds to fill a few 30 minute spots during the family friendly Festival. (A Piano is available.) If you would like to help "bring the music" contact NDavie@fiumc.org. Thank you to all who participated! It was amazing! Sign up for a fun morning of bike riding at FIUMC! Pick up a donation form to raise money for a good cause. Return the form and donations and be ready to ride by Saturday, May 13th. All proceeds raised go to Quigley House (please make checks payable to "Quigley House"). Contact Nora Davie for more info. NDavie@fiumc.org. ADVENTURE CAMP: June 19-23, 2017 | 9AM-12PM, IT WAS A GREAT WEEK!! Saddle up for a week of Cooking and Art! Many special activities are planned for your child so that they will have a fun and memorable Wild West week. These activities will be led by Sharing Tree teachers with help from Fleming Island United Methodist staff, members and volunteers to make for a loving and educational atmosphere. Cost: $100, $10% Sibling Discount. We were created by God and built for a purpose! Is your child ready for an adventure? We have one for them! They will learn what a unique and wonderful creation we are in this hands-on exploration of how we are made by the Ultimate Creator! Ages: Preschool: 3yrs - 5 yrs (Must be fully Potty trained), Elementary: K-5th Grade. Cost: $25.00, with $5 Discount if registered on or before June 18th. Come join your tot in a summer morning of creativity and fun! Classes will be held in room 323 and on the playground. Dress for a happy mess! Sensory bins, Music, art, indoor and outdoor play (weather permitting). Cost: $5 per child/per session, parents free. Snack included. Call ahead to sign up and just pay when you come. Please let us know if your child/children have any food allergies upon registering. Contact Nora Davie for more information @ NDavie@fiumc.org. Registration Closed. Check back for future dates.